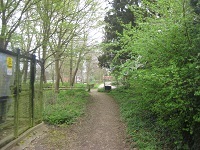 Nightingale Lane runs from Bournehall Lane to Bournehall Avenue, close to the Moatfield. It is a natural continuation route, shown in red, for riders using bridleway Bushey 55, shown in blue. Image based on original obtained from the Ordnance Survey Get-a-map service. Image reproduced with kind permission of Ordnance Survey. 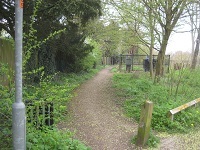 11 Feb 96: Application made by Bushey and District Footpaths Association to record Nightingale Lane. 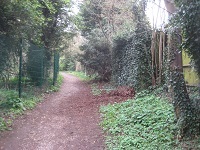 18 Dec 15: The Hertfordshire County Council (Bushey 72) Modification Order 2015 was made to record this route as a bridleway. 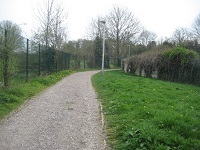 Commences from Bournehall Lane (public highway) at TL 1355 9562 running generally NW along the Moat Field pavillion access track for approx. 75m to a point where it diverges from the access track at TL 1350 9568. Continuing generally NW for approx. 85m then generally N for approx. 75m to join Bournehall Avenue (public highway) at TL 1345 9582. 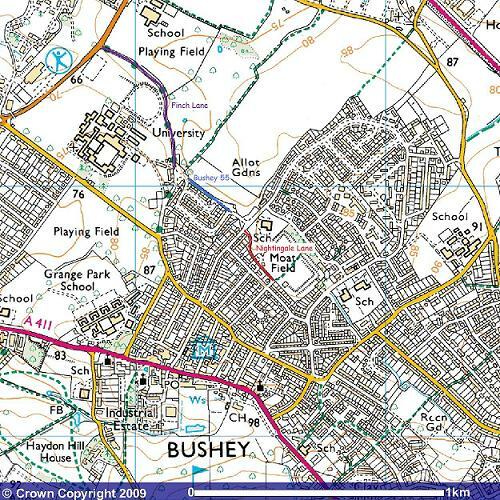 Width: Varies between 3.15m and 12.5m as shown shaded grey in the Hertfordshire County Council (Bushey 72) Modification Order 2015.